Surgeon General Regina Benjamin has said that there is no greater threat to the country’s health than obesity. Since 1980, she reports, obesity rates have doubled among adults and more than tripled among children - with the problem being worse among Black, Hispanic and Native-American children. While it is easy to say that each person should take responsibility for their health, the fact is that childhood obesity is a national problem. One way in which we can battle this problem on a national level is through school lunch programs. First Lady Michelle Obama is trying to tackle this problem at its root with the Healthy Hunger-Free Kids Act of 2010, and the well-known Let’s Move! campaign. Many applaud Michelle Obama’s efforts. The primary push of the new legislation as far as school lunch is concerned is to expand programs and set new higher quality standards with more whole grains, fruits, and vegetables on the menu. 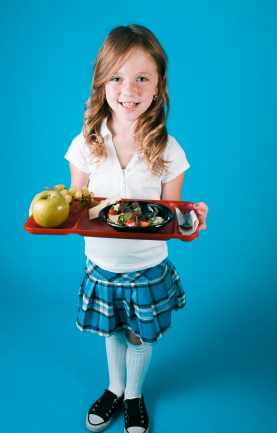 These changes will affect the diets of 32 million children across the United States. The Robert Wood Foundation has found that child obesity rates are declining, especially in the cities of Philadelphia and New York and the states of California and Mississippi. In Mississippi, between 2005 and 2011, obesity declined by 13.3% among elementary school children. These localized declines in childhood obesity are thanks to new federal legislation and campaigns as well as to local efforts. When speaking about legislation that keeps America’s children healthy, everyone can agree that this is a worthy cause. However there are many challenges to the implementation of legislation and campaigns such as the Healthy Hunger Free Kids Act and the Healthy Schools Campaign. First, there are budget issues. Despite financial support from the federal government, as well as a hike on school lunch prices for students who don’t qualify for free lunch, many schools worry that there isn’t enough money to pay for the new higher quality meals. The new legislation provides an extra 6 cents per free school lunch, but some claim that this is not enough to implement such major changes. Challenges to new legislation also come from those who are most directly affected by changes in school lunch as students are vocalizing their distaste for some of the new menu items. In response, the Healthy Schools Campaign has high school chefs competing to create meals that fulfill new health standards and financial restrictions and which aim to tempt the palates of school-aged children. This program encourages students to become a part of childhood obesity prevention through direct involvement in reforming the school lunch program. There are those who claim that Michelle Obama has no business telling our children what to eat. With all of the media and advertising that goes into promoting the unhealthy foods that led to such pervasive childhood obesity, how dare anyone criticize any effort to give all children access to healthy, fresh food? What a child eats throughout the day affects not only their health and weight, but as any teacher will attest, how they perform academically and socially. When we as a country serve cheaper, less nutritious food to our students, we are telling them what to eat just as much as when we serve them whole grains, vegetables, and fruits. The latter option simply provides them with a far better chance in almost every way.